For posting overseas, puzzles are always sent by airmail. In this way you are most likely to receive the puzzle within about 5 working days of paying for it. The price for THE RUNES sent in this way is as follows: Europe: £39.95; USA: $69.00; Elsewhere: £43.95. You can pay by card or by PayPal. For your security we do not accept card payments on this site. These are handled through PayPal's secure internet payments system. Your card details remain secure and confidential. They are not disclosed to us. This service is free to you and you do not need to have a Pay Pal account to use it to make card payments. With the order confirmation will be the link to the secure PayPal site, where you can decide how you would prefer to pay. We will then ship THE RUNES within 1 working day. Don't miss your chance to solve the World's Greatest Puzzle! Place your order by phone, e-mail or site message. 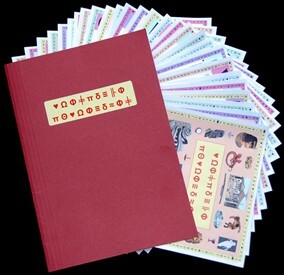 THE RUNES is posted to UK addresses by first class Royal Mail, with a certificate of posting. This certificate proves posting and will be made available in the event of non-delivery, but beyond that we cannot be responsible for delivery problems. International shipments are always sent airmail. Cash returns are not available. Please note that the folder is not part of the puzzle - it is there as extra packing to protect the pages inside.